Baskets are really a great and ancient way to store things. Not to mention they can hide items that are not so beautiful, yet make your space more beautiful because of their disguise and uniformity. 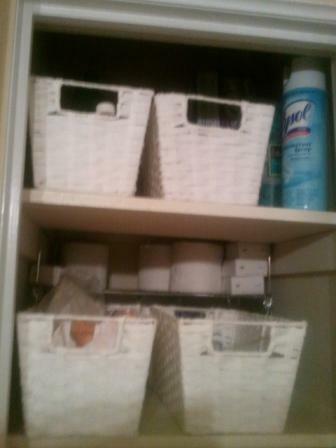 Recently I added some baskets to my bathroom closet and clothes closet. Check out how I color coded my clothes! The baskets I purchased were from Lowes but you can find great baskets almost anywhere. For my clothes closet I stored belts, small hand purses, gloves, cosmetic bags, etc… For my bathroom closet I stored facial lotions, feminine products, soaps, and wash cloth’s in each basket. I really like how it looks and these baskets hold a lot. 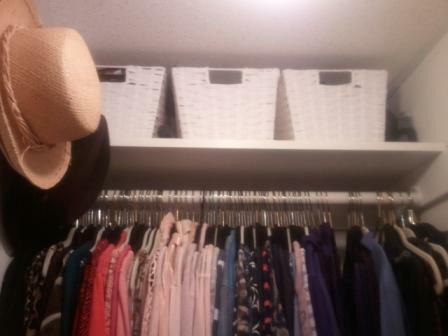 Well, I hope I’ve inspired you to check out your closets today to see what items you can store in baskets! This entry was posted in Residential Organizing and tagged Bathroom Organizing, Closet, Closet Makeover, Closet Organizing, Clothing, Organizing a LInen Closet, Organizing Closets, Organizing Products. Bookmark the permalink.